Formulawire.com is the PUP that uses misleading techniques to prevent removal. Use Reimage to locate malicious components and get rid of them faster than with uninstall instructions. A full system scan blocks virus reappearance and prevents traffic to malicious domains. Formulawire.com is an untrustworthy website that can redirect Google Chrome and other popular web browsers to questionable domains. 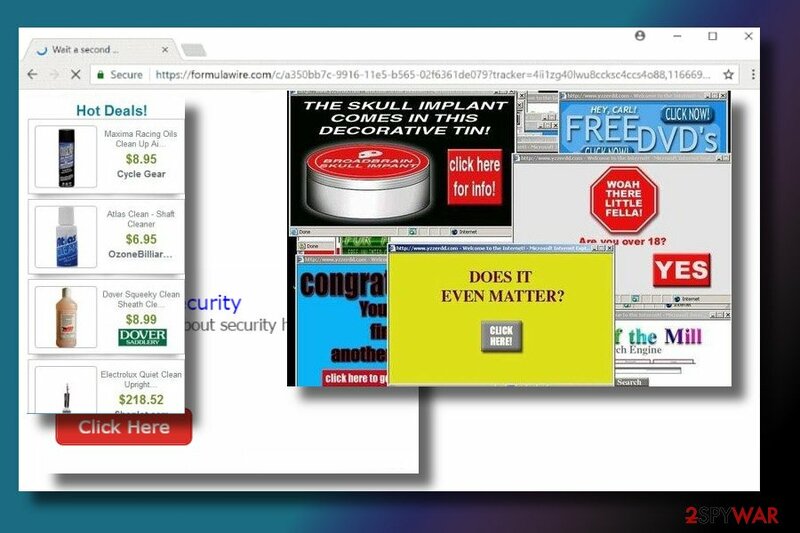 Although many cyber security experts consider it to be a browser hijacker judging from its name, constant redirects to suspicious websites via Formulawire.com server warns about adware infection. Just like most of the adware-type programs, Formulawire.com adware is distributed by bundling. In other words, people unintentionally agree to install it as an additional installer of other free programs. Once installed, it drops a malicious web browser extension on the web browser that is currently the default one and starts initiating unwanted activities. The primary task of the Formulawire.com virus is to initiate redirects to http://Formulawire.com/, which can further reroute to various commercial domains or even infected websites. This way, third-party website developers are trying to generate traffic to their sites or promote less popular products. 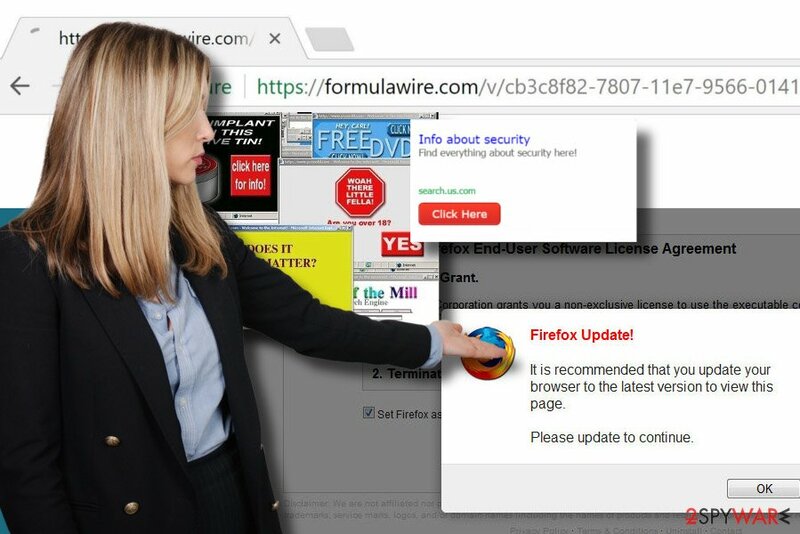 Although such marketing strategy is legitimate and used widely by many website developers, Formulawire.com virus is an exception. Security experts recommend people to remove Formulawire.com asap due to a high-risk of redirects to suspicious and malicious domains. Formulawire.com ads can also promote various software extensions or potentially unwanted programs (PUPs). Some of them can be ad-supported, while the others can use web beacons to spy on you and steal sensitive data. Although you can remove Formulawire.com manually (the instructions provided below), we would recommend using Reimage or another security tool and eliminate it automatically. This way, you will not only save your time but will also ensure the removal of all other PUPs that might be installed by bundling. Usually, unwanted activities, such as redirects, unstoppable advertisements, slowdowns, etc. on a web browser starts as if out of nowhere. However, many people are still not aware of the fact that PUPs, namely adware and browser hijacker, spread as parts of freeware installers. In fact, downloading free software from third-party download sources is a high-risk task. Apart from downloading useless programs, people can be tricked into installing PUPs in the form of attachments or additional installers. Various extensions, add-ons, and plug-ins travel as pre-selected items, which are disclosed only under Advanced or Custom installation methods. If people select Quick or Recommended installation settings and do nothing else except hits Enter all the time, it's not surprising that pop-ups and ads hijack their web browsers. Thus, to protect your PC, your privacy, and peace of mind, install free programs using Advanced installation settings and don't skip pre-marked options. To prevent redirects to potentially dangerous websites and excessively showing ads, you should remove Formulawire.com virus from the system. As we have already mentioned, the adware program that was installed on your PC unnoticed is responsible for all unusual activities. Therefore, you will have to eliminate it first. Those who save time can initiate Formulawire.com removal automatically with the help of [d]. Those who are fond of manual removal of cyber threats should carefully follow removal instructions given below that explain how to remove the adware and get rid of Formulawire.com ads from Chrome. Here, look for Formulawire.com or any other recently installed suspicious programs. Drag Formulawire.com related programs to trash. After that, check the system for other potentially unwanted programs and do the same with all of them. Wait until you see Applications folder and look for Formulawire.com or any other suspicious programs on it. Now right click on every of such entries and select Move to Trash. When in the new window, check Delete personal settings and select Reset again to complete Formulawire.com removal. Once these steps are finished, Formulawire.com should be removed from your Microsoft Edge browser. Here, select Formulawire.com and other questionable plugins. Click Remove to delete these entries. Now you will see Reset Firefox to its default state message with Reset Firefox button. Click this button for several times and complete Formulawire.com removal. Here, select Formulawire.com and other malicious plugins and select trash icon to delete these entries. Click Reset to confirm this action and complete Formulawire.com removal. Here, select Extensions and look for Formulawire.com or other suspicious entries. Click on the Uninstall button to get rid each of them. Now you will see a detailed dialog window filled with reset options. All of those options are usually checked, but you can specify which of them you want to reset. Click the Reset button to complete Formulawire.com removal process. ^ Julie Splinters. Un spital a plătit $55k pe decursul unui atac de tip ransomware. FaraVirus. Provides information about cyber threats and general cyber security. ^ Colleen McKown. The American Greed Report: Online shopping scams: Eight signs you’re on a fake site. CNBC. World leader in business news. ^ Stephanie Linning. Terrifying experiment reveals just how easy it is to get people to share personal details including their National Insurance and bank account numbers - just for the chance of a free TV Read more: http://www.dailymail.co.uk/news/article-3986426/I-ve-just. Daily Mail. Online Magazine. This entry was posted on 2018-02-09 at 08:57 and is filed under Adware, Viruses. You can quickly scan the QR code with your mobile device and have Formulawire.com manual removal instructions right in your pocket. How did you remove Formulawire.com?